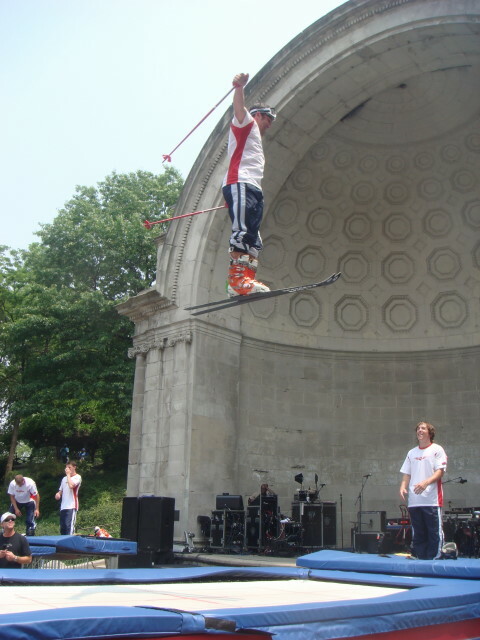 On Saturday, there was a special exhibition being performed in Central Park. It seems to be called “Adventure NYC” and was pretty cool. The weather was hot and sunny (although it stormed much later in the day) and the biggest sight was a welcome one for a lot of kids and parents. 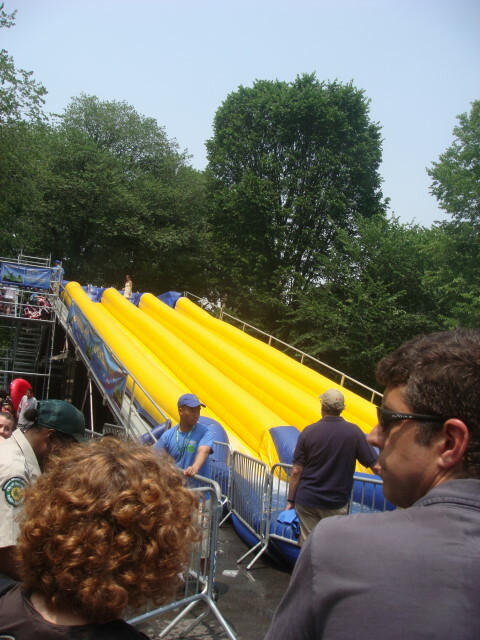 A temporary water slide. 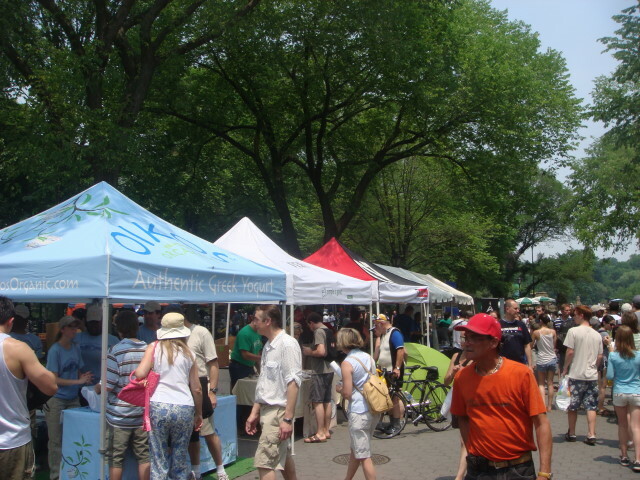 Near the waterslide were some tents/kiosks. They had a variety of items there. I managed to get a free sample of some pretty good Greek yogurt. There was a backpacking place. And a place that was showing off their one-man tents. But the biggest thing around? A half-pipe for bikes. It was set up right in the middle of the Park and there were a lot of people around watching bikers going on it. Because it was temporary; no elevator. At least no internal elevator. 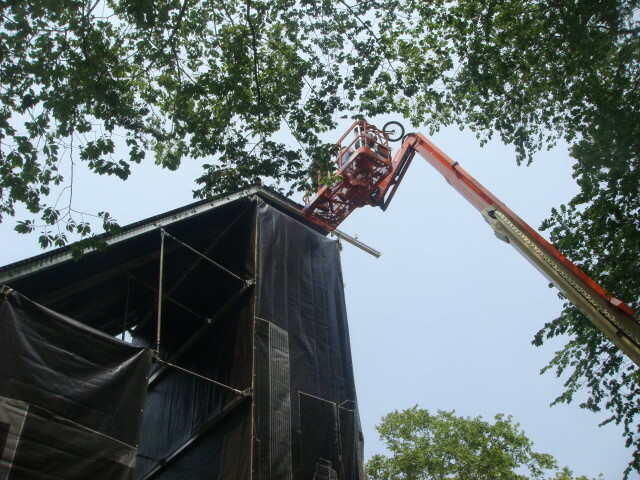 Instead, they had a cherry-picker that would take up two bicyclists at a time. One on this side of the half-pipe and one on the other side. 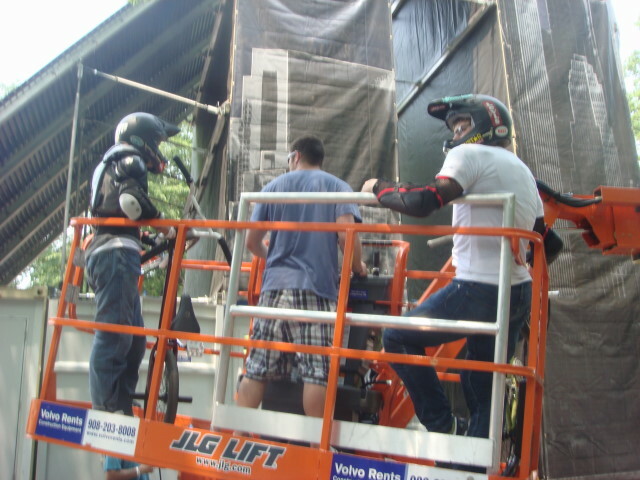 That is, four bikers would meet on the same side of the actual pipe, but two came up a cherry-picker on one side and the others on the other side. Here they are going up on the cherry-picker. It was 50 or 60 feet up, I would guess. They would come down the same side one at a time. It took maybe 90 seconds for all four to finish each round and then new riders would go up. Here’s a shot of how they would come down the side. 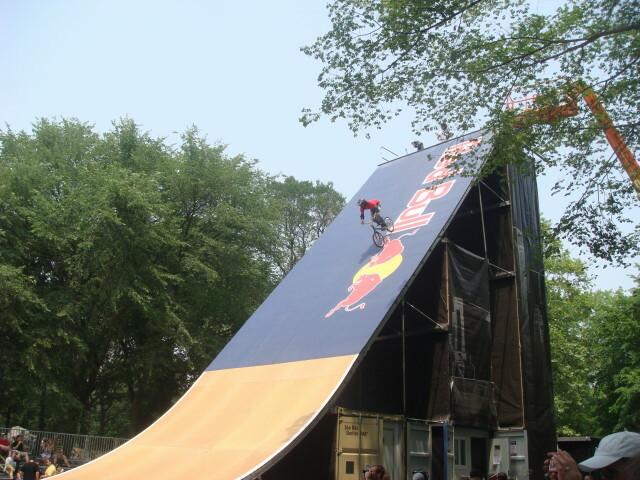 Once they reached the top of the up-ramp part of the half-pipe, they didn’t seem to do any tricks. They’d just go for big air and a little hang time. 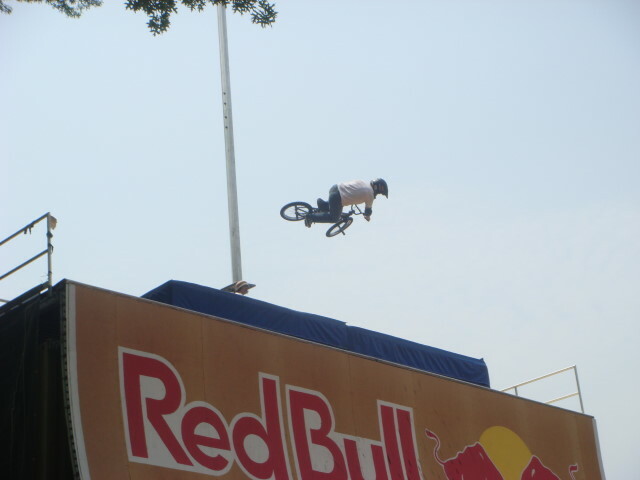 This picture below is about the best one I got of the big air. Once they came down, they’d just ride off the ramp. They didn’t go back up the side they had originally come down. 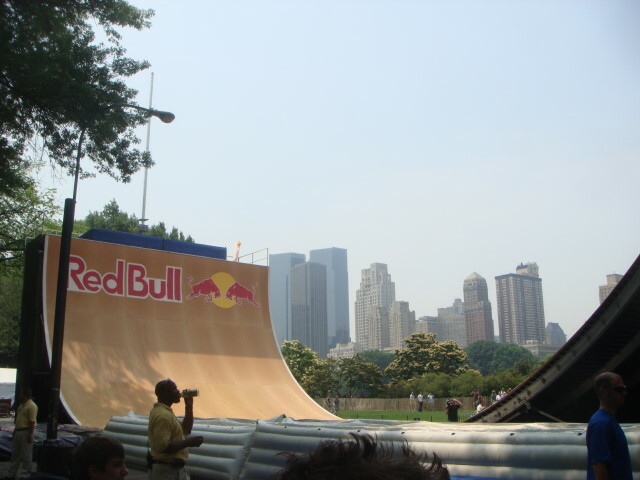 And the half-pipe was only for registered riders. The public was just allowed to watch. 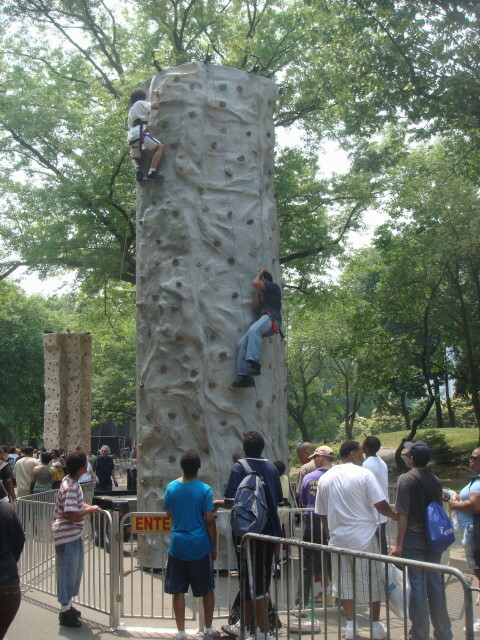 Nearby was a set of three artificial rock climbs. 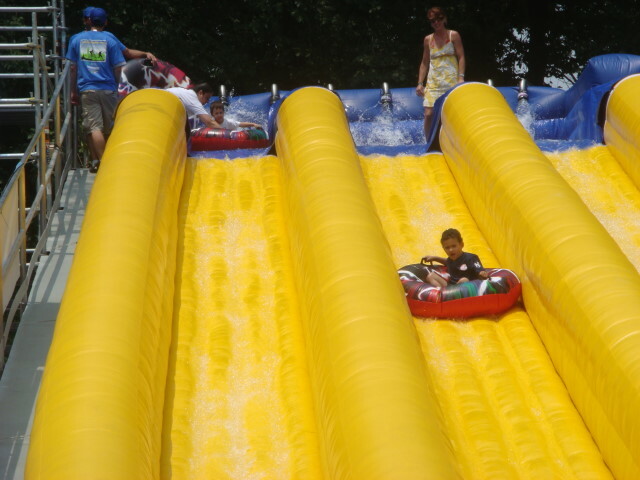 Two were in pretty good use, but the line was much smaller than for the water slide. But the thing I liked the most was a trampoline set up near the clam shell. 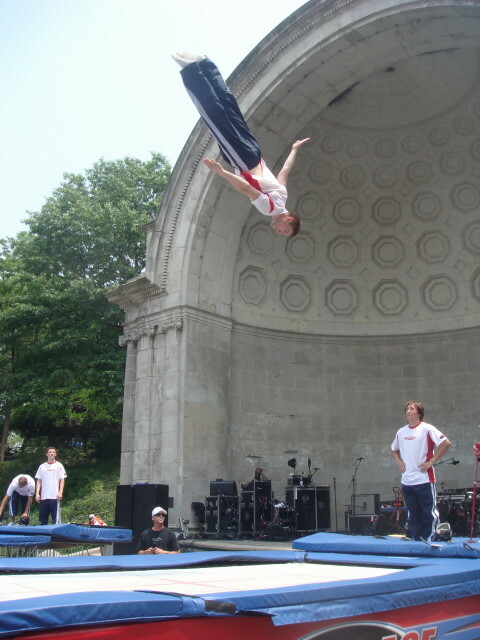 It was a group of trampolinests called “Flying Aces”. It consisted of five guys from Utah, Texas, and New Jersey. They had two trampolines set up side by side. 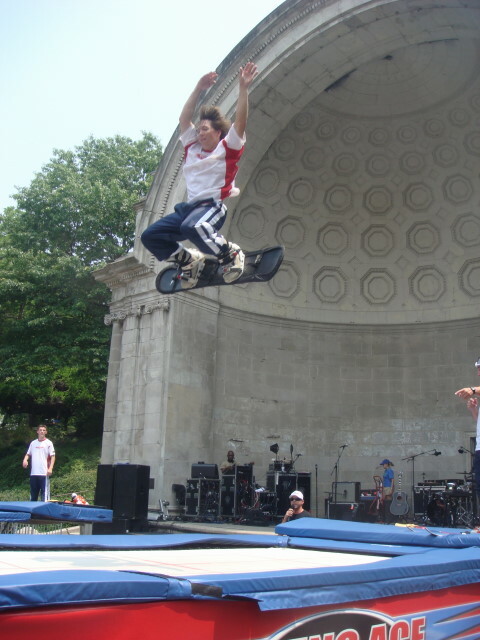 Apparently, these guys ski and snowboard in the winter, but in the summer they trampoline. They pulled out their skis and snowboards to perform tricks, but they are probably just their training exercises for their real jobs. One of them is up for the Olympics from what the announcer said. Who knows? Nevertheless, they did one heck of a lot of stunts. They guy below was a real showman. At one point he did some stuff so high I couldn’t believe it. You just feared a puff of wind that would knock him ever so slightly off course. Being side by side trampolines, they really got into synchronized stunts. Lots of flips and all done by both at pretty much the same time. 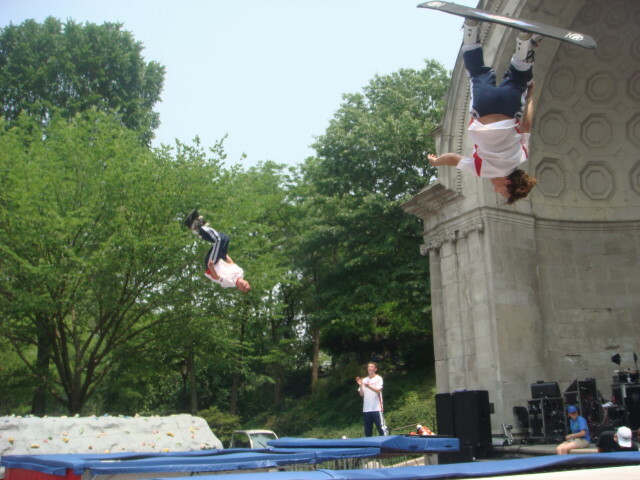 All in all, the trampolines were the height of the Adventure event. Really, really good. 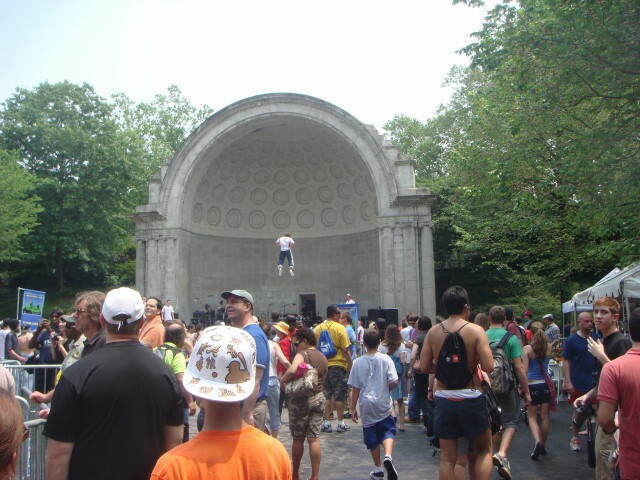 This entry was posted on June 15, 2008 at 3:40 pm and is filed under Central Park, Events, Manhattan. You can subscribe via RSS 2.0 feed to this post's comments. You can comment below, or link to this permanent URL from your own site. Slightly off topic perhaps, but a request for you to think about the ethics of purchasing cheap trampolines. Do try and consider, for example, the things your item is manufactured from, the human rights of the employees where they’re manufactured and the green credentials of the retailer. And try to repair your trampoline instead of throwing away. Thanks!!! !